Have you ever wondered, "Where can I buy clothes rails?" If so, you've come to the right place. Clothes rails are such an integral part of our knowledge, experience and day-to-day activities that you could even say that clothes rails are in our DNA! Here at Shopfittings Manchester, we carry a vast range and quantity of clothes rails in stock, enabling us to immediately service the requirements of virtually every clothing rail customer, from retail to domestic. 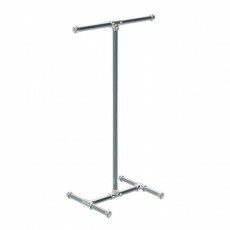 Discover our portable clothing rails, which are ideal for sale promotions as they are easy to both, dismantle and store. 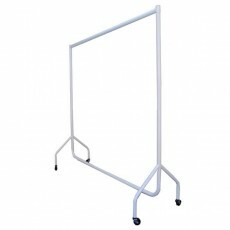 They are also very popular for house moves and people that need a temporary clothes rail. These are known in the trade as "reps' clothes rails", "sample rails" or "reps' rails". 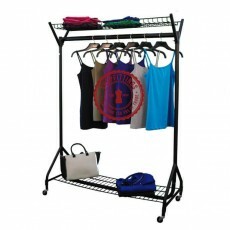 These are made of lighter weight chrome material and are designed as folding clothes rails, for easy transportation. We are very proud of our superior hanging rails for clothes. These are manufactured in the UK, and at only a couple of pounds more are designed for heavy-duty commercial use. 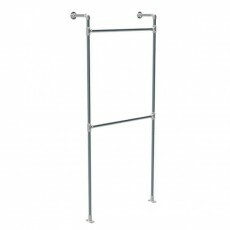 Industrial clothes rails are best suited to busy retail environments. The range includes lengths from three feet to six feet, with the option of buying height adjusting extension tubes to make low rails higher for longer garments. We currently have available from stock, a range of Italian designer garment rails for fashion retailers. These are on sale in two different finishes chrome or gun metal in a curved or straight design. 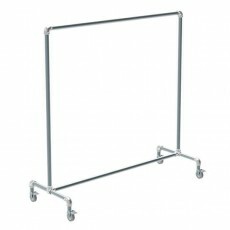 These have proved very popular with fashion retailers who are looking for an elegant designed freestanding garment rail. We carry a huge range of very competitive freestanding clothes rails known as feature rails, which are designed specifically for clothing retailers. 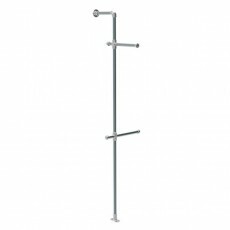 These are available to buy in superior chrome finish, in eight different styles and are fully adjustable. 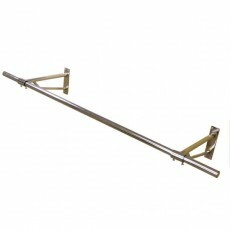 We also supply add on shelves/arms, which are compatible with our feature rails. Our wall-mounted rails including the circular D-shaped hanging Gridwall rail are perfect for optimising space. 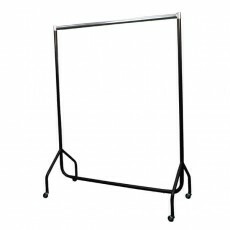 Combined this with either wooden or steel coat hangers are ideal for displaying or storing covered clothes in a tidy manner. For the more price-conscious clothes rail consumer, we import flat-packed clothes rails from the Far East. These cheap clothes rails are available in four different widths. You can also convert our 4-foot clothes rail into a handy space saving rail through option top and bottom shelves that can be attached. 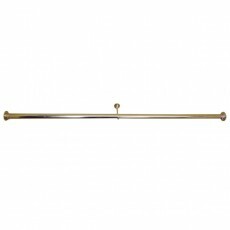 Our cheap hanging rails will save costs but feel assured knowing that there have been no sacrifices made in terms of quality. You can purchase centre bars to convert the rails into double or even multiple hanging rails, which many of our customers use in their stock rooms. Additionally, we offer garment rails equipped with two types of castors, or with a stable 'fish-tail' base, which has proven to be perfect for domestic rail use. 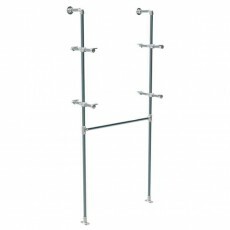 Our sturdy clothes rails are not only practical they are also visually pleasing. Our apparel rank range is currently available in standard black, white or chrome; these finishes can be mixed and matched to suit customers' individual requirements. The most popular combination of rails is to mix the black rail decorated with a stylish chrome top. Vintage, modern or bespoke we can spray your clothes rail storage choice to match your individual requirements. Please note that there is a minimum order quantity of approximately 25 garment racks and this also depends on the availability of the powder coating pigment. The Shopfitting's Manchester staff are fully trained in all aspects of clothes rails; if you have any queries, or need help in selecting the right product, please don't hesitate to call us on 0161 834 8943. Alternatively, you can get in touch with us by filling out our contact form.